Hit the mean streets with Jake Hunter, and help clean up Aspicio City. Point and click adventure games, as well as their Japanese brothers visual novel style games, are one of my favorite genres in all of gaming. I remember getting an issue of Nintendo Power right as the DS was getting released that had a trailer DVD with it. A few friends of mine and I decided to watch it and were treated to videos of games like Trace Memory and Phoenix Wright. It was at that moment that I realized that the DS was one of the saviors of the long forgotten but never lost genre. Now having played all of the Ace Attorney games, Lifesigns, and many others of the ilk, I have come to appreciate each game that comes my way in the same genre. Not too long ago, Aksys games pledged to bring more visual novel games to western audiences since there was obviously some sort of audience for it given the popularity of the Ace Attorney series. 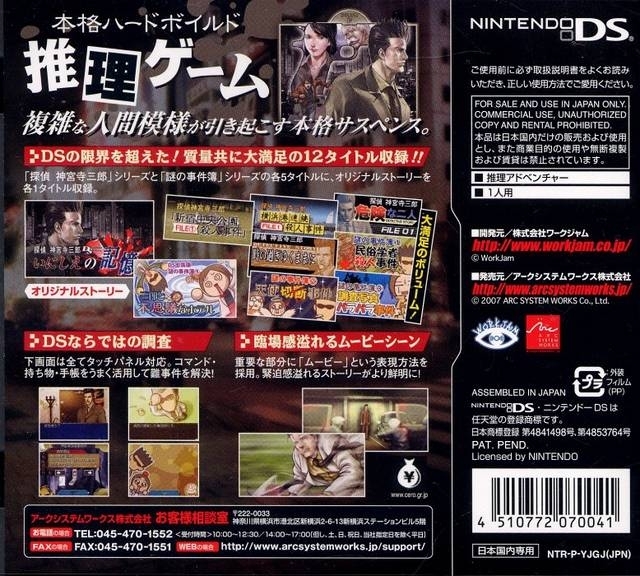 Aksys chose a venerable game series called Detective Saburo Jinguji to be their guinea pig. 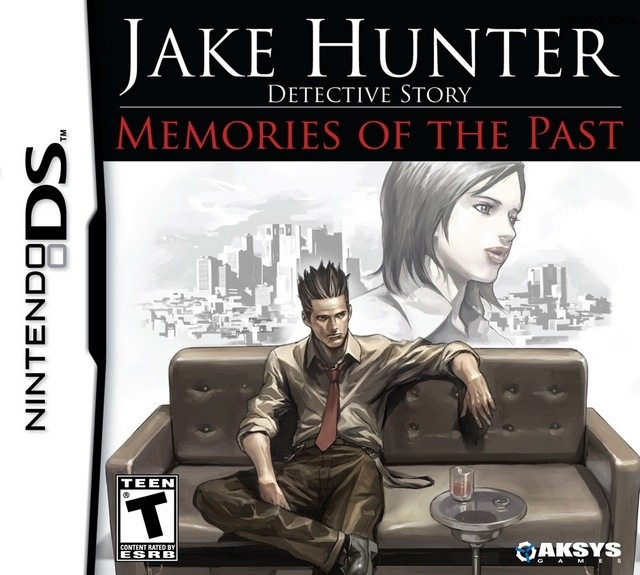 Jake Hunter: Detective Chronicles for the Nintendo DS was born. 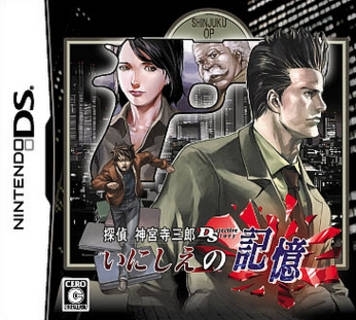 As the game begins, we meet Jake Hunter, a young, no-nonsense chain-smoking private detective, and his lovely secretary Yulia who runs a small detective agency in the middle of Aspicio, a made up American City (the original games take place in the Shinjuku a part of Tokyo, Japan). Jake uses his no-nonsense skills to get info from the police, and Yakuza alike. Because of this, Jake is a feared force in the land of detectives and has had his life threatened many times. Detective Chronicles consists of three relatively short, unrelated cases with each taking just over two hours to complete. Case one involves Jake helping the police after the strangled corpse of a popular bar hostess is discovered at a park in Aspicio. The second case tells the story of a desperate man who hires Jake to find his missing fiancé, which begins to unravel many twists such as organize crime getting involved. The third and final case involves Jake and Yulia visiting a friend that is a motorcycle racer. This all goes awry when Yulia’s friend crashes at the circuit, but a different racer's body is recovered from the crash site. As you can see, every scenario plays out like a self contained episode of your favorite TV detective drama. Due to this, the episodes are not interwoven at all, but are fun nonetheless. The game itself is almost more of an interactive novel than a totally immersive game. This is in part due to the linearity of the cases, in which you have no way to fail. In some games, you get penalized for making wrong choices, but not so in Jake Hunter – there is no game over. 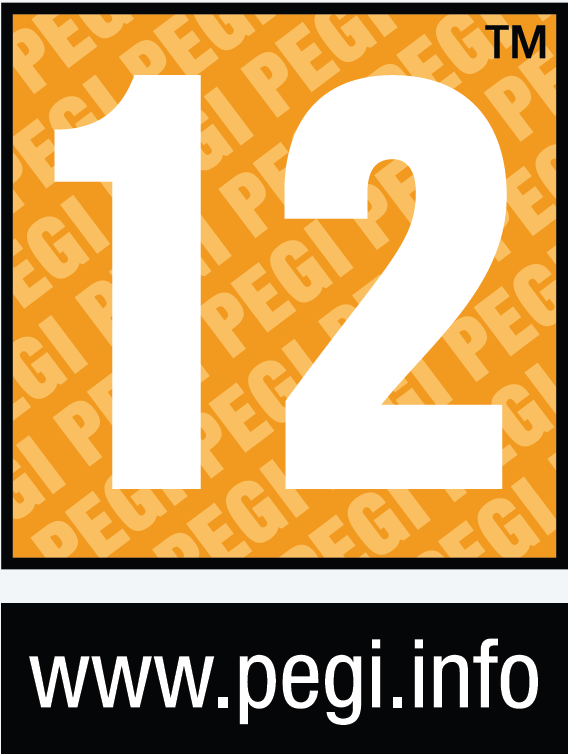 You do, however, have a few interactive options available at anytime such as looking at your surroundings, talking to people that you have seen, or presenting items (such as your business card). You can also smoke in order to give yourself a hint or clear your mind. As you progress through the dialog tree, there will come a time where the chapter ends; it is at this time that you smoke once again in order to think about what has happened. This comes in the manner of a pop quiz to make sure you were paying attention. For fans of Trace Memory or Hotel Dusk, you guys are used to this already. After Jake answers enough questions correctly, he will have an epiphany and you move on to the next chapter. One thing that I thought was cool in Jake Hunter was that there are times where you have to take the law into your own hands. For instance, at one point in the second case, you start getting tailed by a group of thugs. Once you find a dark alleyway behind an abandoned building, you are presented with a sort of a fighting mini game presented with the same menus as the rest of the game. You then get to interrogate those thugs that tried to knock you off. This added a bit more realism and grittiness to the game, to help it seem like it really could happen. Unfortunately, Detective Chronicles is the victim of a poor localization. Games like this are always heavy in Japanese cultural references that Joe Schmo American will not understand or care about whatsoever. Due to this, there are always two paths of action that a company can take. 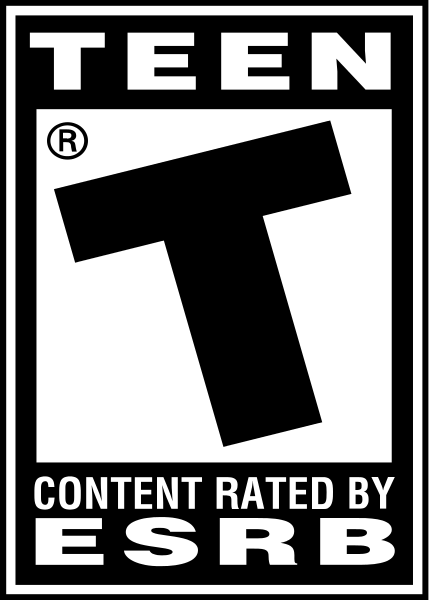 One is the complete and total revision of the game’s story. This has worked well in games like Phoenix Wright: Ace Attorney, where the setting was shifted to America, and many references and jokes were rewritten for American audiences. The second option would be to translate the game exactly as it was in the original Japanese, and possibly alienate a new fan base that could get into the game. It seems, that unfortunately, Detective Chronicles utilized neither one. What we got was a weird combination, where some things were changed (like character names, places etc. ), and other things (like big cultural references) were not. For example, in the case about the murdered bar hostess, most people will not see the significance of her job. In Japan, the bar hostess is the modern equivalent of the geisha. Because of this, and the fact that seedy hostess bars pop up everywhere, it was a shock to find out that the victim went from a very high paying job, to a job that many look down upon. This is furthered when Jake finds her business card case, and mumbles about it for a while. Without my previous knowledge of a bit of Japanese culture, I would have been completely lost as to why that segment of the game was important at all because the translation does not even attempt to explain it. The poor localization does not end there unfortunately. The game has a lot of typos, which are not uncommon in translated games and weird dialog at times. The main victim of this was the namesake Jake Hunter. Jake comes across at times about as interesting and charismatic as a brick with Keanu Reeve’s face drawn on it. A bit of creative writing could have added a bit more humor or something to the mix to help establish characters, and the current translation makes all characters bland and boring. One thing that really stood out in games like Hotel Dusk and Phoenix Wright, was that the characters were well fleshed out and by the end of the game, they became your friends. By the end of Jake Hunter: Detective Chronicles, I wanted to take a nap. 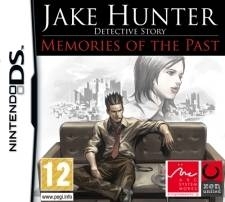 The biggest flaw that Jake Hunter: Detective Chronicles brings to the table, is that it is missing a lot of material from the original Japanese game, including cases. 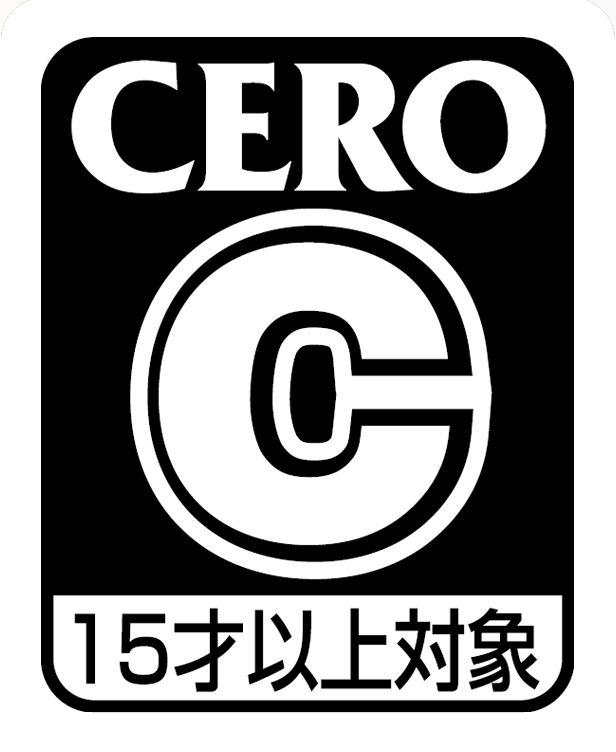 The original game consisted of previously available mobile phone remakes of the original five Famicom disk system games and a brand new case that tied them together. This package was released as a 20th anniversary game in Japan and ushered in another game with more remakes. Aksys wanted to test the waters (rather than take a full on plunge) and cut three cases from the game and most of the bonus content, in order to make a budget game. Unfortunately, due to this making the game a mere seven hours long it is hard to justify a purchase. The graphics in Detective Chronicles are usually nice looking for a game like this, but the static images are neither animated nor eye-popping, so it seems a little bland. One thing I would have really liked to see was images of characters that changed with the circumstances that were happening. Instead, you get an uncomfortably stoic look on Jakes face whether he is sleeping, talking to a cute girl, getting shot, or any other instance that happens in the game. This once again serves to make the characters seem lifeless and shallow. The backgrounds look really nice and seem to either be real photos the majority of the time, or really nice paintings. Detective Chronicles does feature a few nicely animated cutscenes with a bit of anime flair. These are used primarily for openings and endings, and really help set the scene. On the audio front, the music in Jake Hunter is a mix of jazzy detective music that seems to be inspired by old film noir movies. This music not only helps set the tone of the game, but makes you feel like a real detective as you play the game. The only bad thing I can say about the music is that due to the overly somber tone in the game and the jazzy atmosphere of the music, you sometimes feel as if the two don’t fit well together. "Like a Phoenix, Jake Hunter has been reborn as a game infused with personality and a brand new localization that will keep you coming back for seconds," says Frank deWindt II, Project Lead, Aksys Games. "We hope this new Jake Hunter will appeal to new and old fans alike." This new game in the series makes Detective Chronicles completely obsolete unless you can get it for dirt cheap.